With this eerie, provocative, and utterly original novel, Rupert Thomson takes the psychological thriller into unexplored territory. Martin Blom is walking toward his car in a supermarket parking lot when a single random bullet pierces his brain. From that moment he is blind--his doctor says permanently. But then one evening Martin discovers what is either a genuine miracle or a delusion suffered occasionally by the newly blind: in the dark, he can see. Armed with this ambiguous gift, Thomson's protagonist enters a nocturnal world of strip clubs and sleazy hotels. In that world, an alluring young woman may give herself to the one man she thinks is unable to see her, only to vanish inexplicably. In that world, a blind man may become a murder suspect. 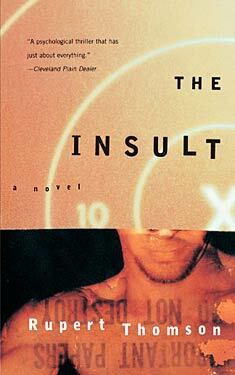 And in the gorgeously disorienting world of The Insult, reality itself is a consensual hallucination. And you succumb to it at your own risk.